What better way to exit a winter-long hibernation that to rent a weekend beat on a salmon river? 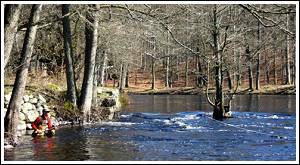 Not just any Nordic salmon river, but the Mörrum- the provenance of the King of Sweden. Like all Atlantic salmon fisheries, the Mörrum is steeped in history. But there is no need to speak of metaphorical legend as this river has a documented salmon run chronicled since the 13th century! The river flows through a forested valley surrounded by farms and granite hills. The namesake town offers the perfect staging grounds for a weekend get-away: 2 grocery stores, 2 fly shops, and a train station make this place feel like a neighborhood fishery. Conveniently, all of them are wader-friendly. Headquarters is the Crown Salmon Center. Home to a visitor's center, museum, aquarium, hostel, and a restaurant, the Lax house is the perfect place to watch the theatrics of salmon fishing from pool #1. This is also where you pay for the privilege of fishing a beat. Don't forget to wear your permit on your person. 32 well-marked beats divide the 7 kilometers of fishable water. 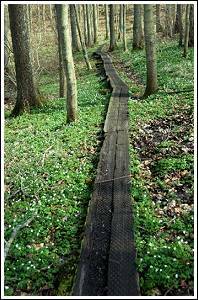 A magnificent network of double plank walkways parallel the water's edge and hide muddy, steep banks. These stream-side paths line the banks and keep one from sliding into the tawny river. There is also a series of platforms and wire-crossings across small islands for those who dare. 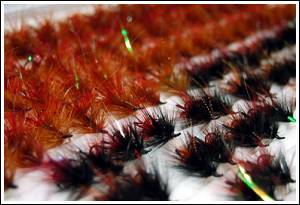 Each beat is designated fly or spin or both, and changes throughout the season. Paying attention to the signs can save you from a costly fine. 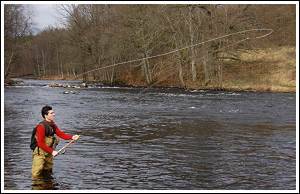 The opening month of April is regarded as prime sea trout season. These large specimens are cousins to the famed Tierra del Fuego sea-run Browns. Europeans, especially Norwegians, Danes, and Germans, flock here to warm-up for salmon season and to enjoy the earliest run of salmon on the continent. The river is fed by a large dammed lake which drains from the top. The water warms to an ideal temperature by early May. 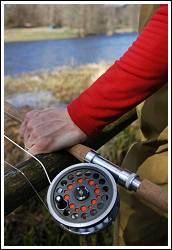 Salmon fishing is new to me, and so is the gear. Without exception, two-handed rods are the weapon of choice. Walking around with a 13'6" rod makes one feel like a pole-vaulter. Reels are large and wound with enough backing to span the Atlantic. Scandinavian Shooting Heads are the strategic line tactic. These short-bellied lines bound to long lengths of running line allow one to deftly anchor a D loop tight to the bank. 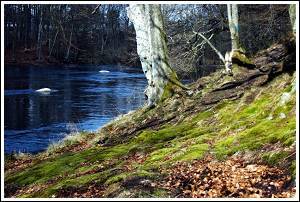 Rarely will the riverbank offer more than a meter of casting room from shore. Forget floating anything- experimenting with various density compensated sink rates is the only way to go. Like a bomb drill, get down and get down fast. Casting these grenades, needless to say, takes timing and skill, and watching the expert locals toss their lines with relative ease is truly remarkable. 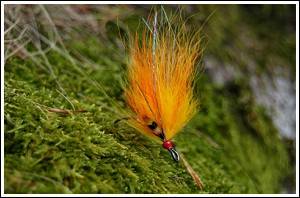 Salmon fly patterns are also new ground for me. In anticipation of this trip I left a pair of scissors and a candle in the bathroom. Every morning, after taking a shower and swabbing my ears with a Q-tip, I would cut the used swabs off, throw them away, and barely melt the ends of the hollow middle section. Each of those Q-tips became the body of a tube fly. Orange is the magic color on the Mörrum. There is more than one theory to account for this mystery, and seemingly endless variations of the same theme: because it works. Single hooks, double hooks, and tubes, are all dressed with Mörrum orange. Interestingly, terminal tackle is strictly regulated in the fall when water flows drop considerably. Length and strength of leaders, fly size, and casting direction are all posted in special low-water regulations. Fishing the King’s water is an aristocratic experience that leaves little to be desired. © Mats Sjöstrand 2008 If you have any comments or questions about the Magazine, feel free to contact me.